Greasy, circular spots in your lawn may be a sign of Pythium blight. Active in hot, humid weather and most common in immature grass, this fungal disease causes 1- to 2-inch-wide spots that rapidly blend together. White, fuzzy mycelium may appear on the lawn, and the grass may turn brown and die, making reseeding or resodding necessary. Proper lawn care and professionally applied fungicides can control the disease. Keep people and pets away from chemically treated areas as long as the lawn professional recommends, and keep children and pets away from chemicals and lawn-care equipment. Because Pythium blight is active in wet conditions, you can manage the disease with proper watering and drainage. Water your lawn early in the morning so that the grass can dry during the day, and avoid walking on the lawn when it is wet. Grass generally benefits from 1 inch of water per week from infrequent, deep irrigation rather than frequent shallow irrigation. In order to prevent the fungus from spreading, reduce the water for Pythium-infected areas. Adequate air flow promotes evaporation and helps prevent Pythium blight disease. Pruning shrub and tree branches to decrease shade promotes air circulation for the lawn. Thatch is a tough layer of dead plant material at the lawn's soil surface, and it can interfere with drainage and cause water to pool. If your lawn's thatch is 1/4 to 1/2 inch thick, then removing it will improve drainage. One option is to rent a vertical mower and use it for the thatch, and another option is to hire a lawn-care professional to remove the thatch. Proper mowing helps prevent Pythium blight by keeping the grass dense and healthy. 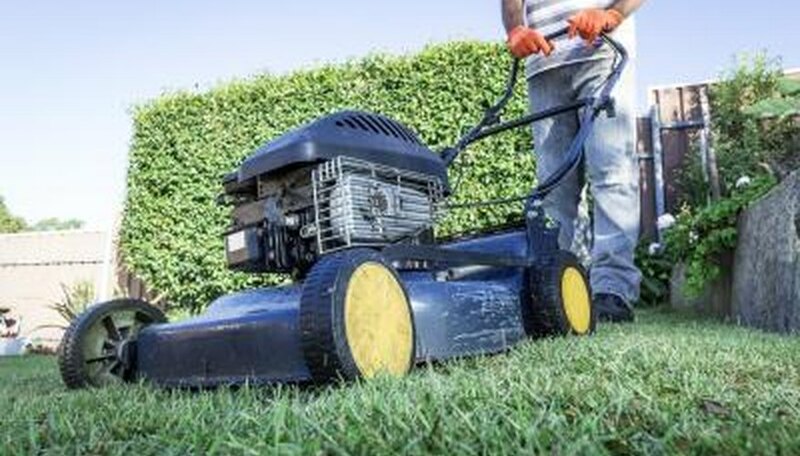 Cut no more than one-third of the grass' height when you mow. If the grass is 1 1/2 inches tall, for example, it can be mowed to a 1-inch height. In order to prevent the spread of fungal spores, avoid mowing the lawn when it is wet or when you see Pythium blight's fuzzy, white mycelium. Wash the lawn mower with water after you mow an infected lawn area to prevent spreading the disease to other areas. High nitrogen levels can promote Pythium blight in a lawn. During hot, humid weather, apply less than 1/2 pound of nitrogen per 1,000 square feet of lawn each month, as recommended by the American Phytopathological Society on its website. Using a foliar spray of slow-release nitrogen fertilizer is an option during the spring and summer months. Lawns typically benefit from monthly applications of 1/8 to 1/2 pound of 28-0-0, liquid, slow-release fertilizer mixed with 5 gallons of water, for example, depending on the grass species. If proper care and management do not control Pythium blight, then applying a fungicide may be necessary. Such a product for Pythium blight is not available for homeowner use, but a lawn-care professional can apply one. Fungicides effective against Pythium blight include propamocarb and mefenoxam, and newer products such as fluopicolide and cyazofamid. Some fungicides, such as fosetyl Al, are effective preventative treatments in certain circumstances. A lawn-care professional may alternate between contact and systemic fungicides to prevent the Pythium blight fungus from becoming resistant to treatment.